How do you know when a deck needs a simple repair or when you will need a total wood deck replacement? There are some signs that you can look for to answer to the question above. What I do when I look at a deck is to inspect the deck thoroughly for general localized damage or for more of a structural damage. Localized damage can be from termites if you catch the damage at an early stage or another example is when a spot has been damp from a water hose dripping or a potted plant sitting on the wood deck for a period of time. In these cases you can replace only those boards. When looking for structural damage, most can be visibly seen, like rotting boards or a sagging deck. 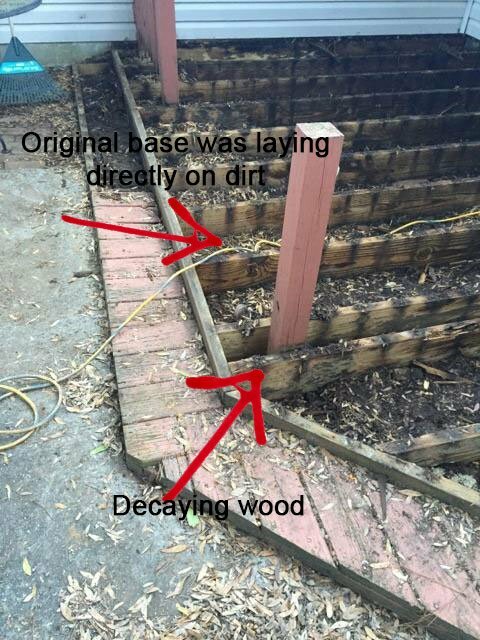 When wood begins to rot, especially underneath the deck, this makes the perfect home for termites. This is not as easy to see as rot on top or the edges of a deck. You may also be able to detect soft spots or spongy spots when you walk across the deck. 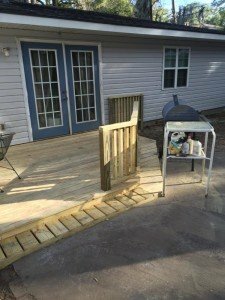 If you are unsure if your damage is local or structural, it’s normally a good idea to have a deck builder professional look at it, as the customer did in this job, I’m about to show you. Once the damage and decay were accessed the customer decided to fully replace this deck, as a partial repair would only mean another repair later down the line. When you are dealing with spots on a deck that are soft when you walk on them, you are really looking at the final stages of life for the deck. We just finished this job at a home in Savannah, Ga, where the original deck had rotted to a point of not being able to salvage any part of it. This particular deck was built right on the ground, which can cause faster decay. The owner knew she needed a full wood deck replacement. As you can see after we tore the old deck out and prepared the new foundation, we laid the wood on concrete risers instead of putting in directly on the ground. This will help the new deck to last longer. Here’s a short video on the replacement.